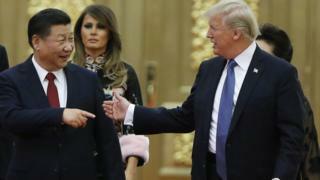 The US has ramped up its trade war with China, listing $200bn (£150bn) worth of additional products it plans to place tariffs on as soon as September. President Donald Trump had already threatened to impose additional tariffs against China if it retaliated. Asian stock markets fell sharply in early trading amid escalating trade tensions between the two economic giants. In China, Hong Kong's Hang Seng index dropped 2% while the Shanghai Composite fell 1.8%. Japan's benchmark Nikkei 225 index shed 1.7%. On top of the $34bn worth of tariffs that came into effect on Friday, the White House has said it would consult on tariffs on another $16bn of products. President Trump has suggested these could come into effect later this month. In total, the new import taxes President Trump is threatening to impose are almost equal to the value of China's entire goods exports to the US, worth more than $500bn last year. "They can't figure out what the end game is."